Conor McGregor made history this weekend when he won the lightweight title by defeating Eddie Alvarez. With that victory, he’s therefore now the first fighter in history to hold two UFC world championships-UFC Featherweight Champion and UFC Lightweight Champion. As the indisputable king of UFC, it’s only fitting that the Irishman would opt for the Swiss crown on his wrist. A notable fan of luxury Rolex watches – Conor McGregor isn’t shy to show them off loudly and proudly on his Instagram feed. Referring to himself as an “avid watch collector”, read on as we delve into Conor McGregor’s top three Rolex watches. Conor McGregor made history this weekend. With its 44mm size case, the Rolex Yacht-Master II is a statement watch that can stand up to Conor McGregor’s bold style and personality. His Yacht-Master II of choice is the full yellow gold version, ref. 116688. Not only does the yellow gold Yacht-Master II deliver high-impact aesthetics, but it’s a complex piece of wrist wear too. Built for serious sailors, the Yacht-Master II boasts a regatta chronograph movement with a programmable countdown and mechanical memory. Although this watch complication may be too niche to be of any particular use to non-sailing wearers of the Yacht-Master II, it’s still a horological technical feat that’s worth noting. Yet another of Rolex’s larger and newer models, the Sky-Dweller made its debut in 2012 and sports a 42mm case. While Conor McGregor may have dubbed his Sky-Dweller ref. 326935 as “Galaxy Caramel”, Rolex’s official name for that dial is “Chocolate”. The rich brown dial of Conor McGregor’s ref. 326935 matches its Everose pink gold construction especially well. The fluted bezel, date window with Cyclops lens, and Oyster bracelet are unmistakably Rolex. On the other hand, the dial of the ref. 326935 is more complex than other models in the brand’s line-up as the Sky-Dweller is actually one of the most complicated Rolexes to date. Wearers of the Sky-Dweller can keep track of two time zones, the month, and the date with one simple glance of the watch. The latest Rolex to grace Conor McGregor’s wrist is the brand new Day-Date 40 anniversary model ref. 228235. Unveiled at Baselworld 2016, this 40mm Rolex President in Everose pink gold features a rich green dial—the brand’s signature hue. Moreover, it has an interesting mix of Roman numerals and stick indexes encircling the dial. In addition to being larger than the traditional 36mm President, the Day-Date 40 also has the Caliber 3255 within. 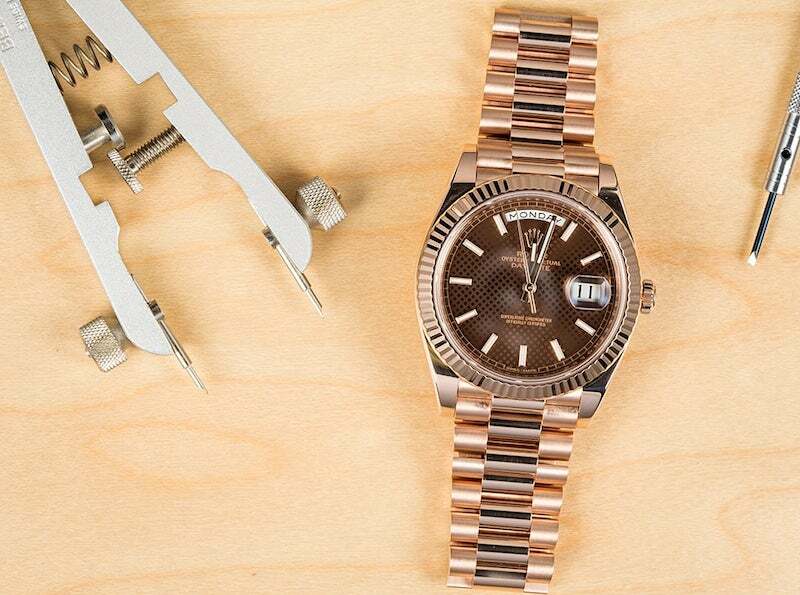 Powering the characteristic day aperture and date window, in addition to the center hands, the Caliber 3255 automatic movement boasts 14 patents for optimal precision and reliability.